1908 photograph, presumably a graduation photograph, of Oren Lovell Farwell of Harrisville, New Hampshire, a senior at New Hampshire College of Agriculture and the Mechanic Arts, at Durham, New Hampshire. 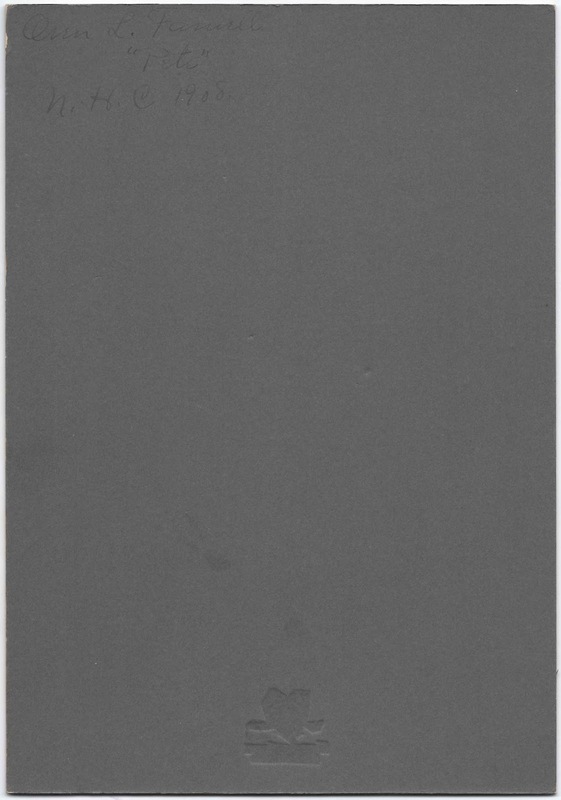 The entire piece measures about 10" x 7"; the photograph itself measures about 5-1/4" x 3". 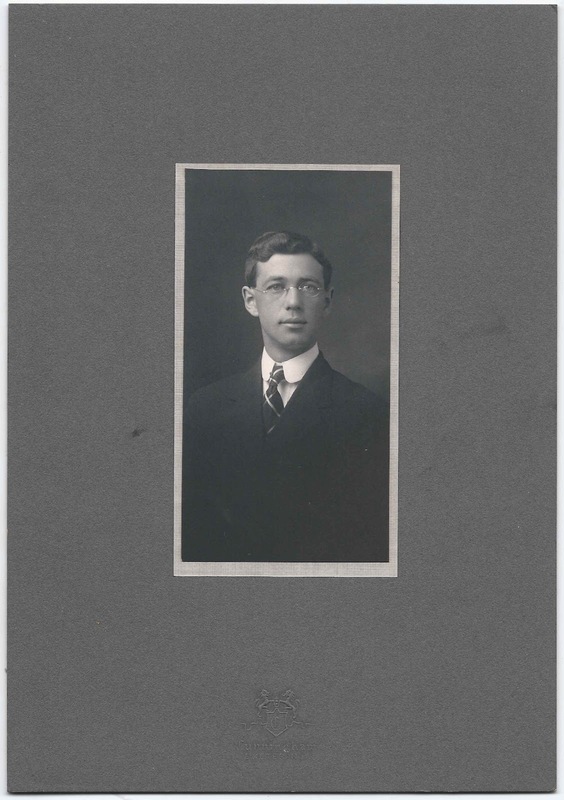 The photograph was found with another 1908 graduation photograph from the same college, that of James Denis Cash of the Massabesic area of Auburn, New Hampshire. Oren Lovell Farwell was born 19 April 1882 at Harrisville, New Hampshire, the son of Corban Curtis Farwell and Delia L. (Yardley) Farwell, who farmed in the vicinity of Silver Lake. In the 1880s, when the railroad came to the area, the farm sold lakefront lots and, later, ice to the summer residents. There's still a Farwell Farm in Harrisville today, though I don't know if members of the same family are operating it. In 1901, Corban Curtis Farwell built a house that still stands: the Corban C. Farwell Homestead, which was placed on the National Register of Historic Places in 1988. Read the "Individual Record" of Oren Lovell Farwell at New Hampshire College of Agriculture and the Mechanic Arts here. A 1909 publication, State of New Hampshire Reports 1907-1908, published in 1909, indicates that after graduation he was at Chesham, New Hampshire, presumably working on the family farm at Harrisville. Oren Lovell Farwell married Emo Millicent Ruffle, daughter of James and Electa Mariah (Farwell) Ruffle. They lived at Harrisville, New Hampshire and raised a family of five or more children. They farmed on the Farwell home farm; Oren was active in town affairs. There's a record in a 1919 issue of "The Shorthorn World and Farm Magazine", where he purchased a Milking Shorthorn bull and heifer. Chesham, New Hampshire, was the farm's mailing address. Emo Millicent (Ruffle) Farwell died in 1934. Oren was still alive in 1942 when he completed a World War II Registration Card. He had apparently died by 1955 when the town report of Harrisville, New Hampshire included an item in its warrant about accepting $200 from Oren's estate for care of the Oren L. Farwell cemetery lot. If you have corrections and/or additions to the information above, please leave a comment or contact me directly. Be careful about leaving information in the comments section about living people.